Who's ready for cosy sweaters, chilly breezes and great formulas? It’s hot here. Like, hot. And humid. And gross. 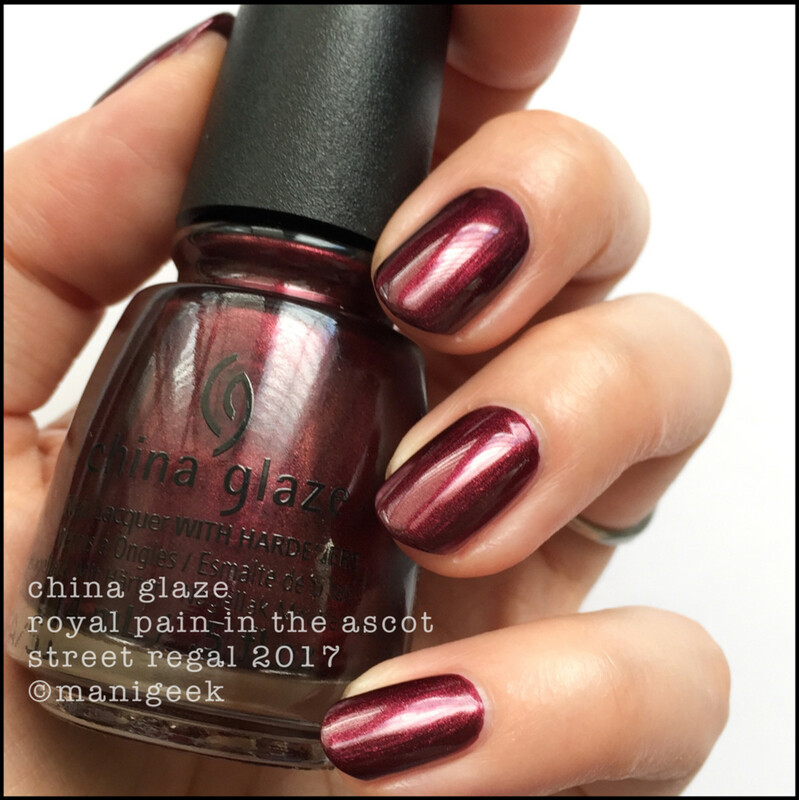 I’m not a fan of hot and humid and gross so I’m kinda chuffed to be playing in the China Glaze Fall 2017 Street Regal Collection. It makes me think about wearing sweaters and being cooler. That’s not to say I ain’t already cool though, right? Har! 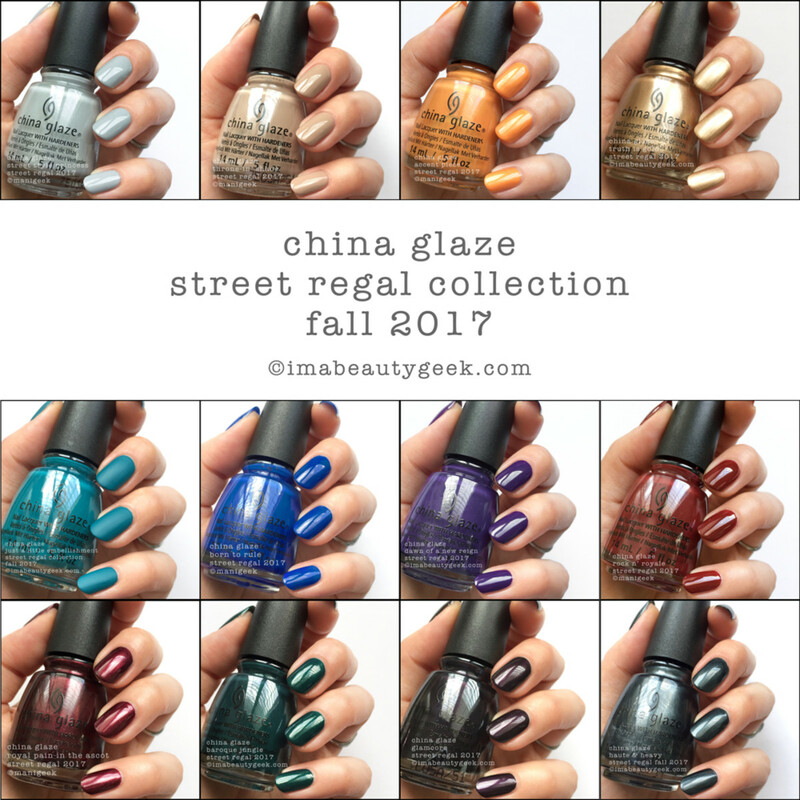 So the 12-shade China Glaze Street Regal collection… Shall we? We shall! 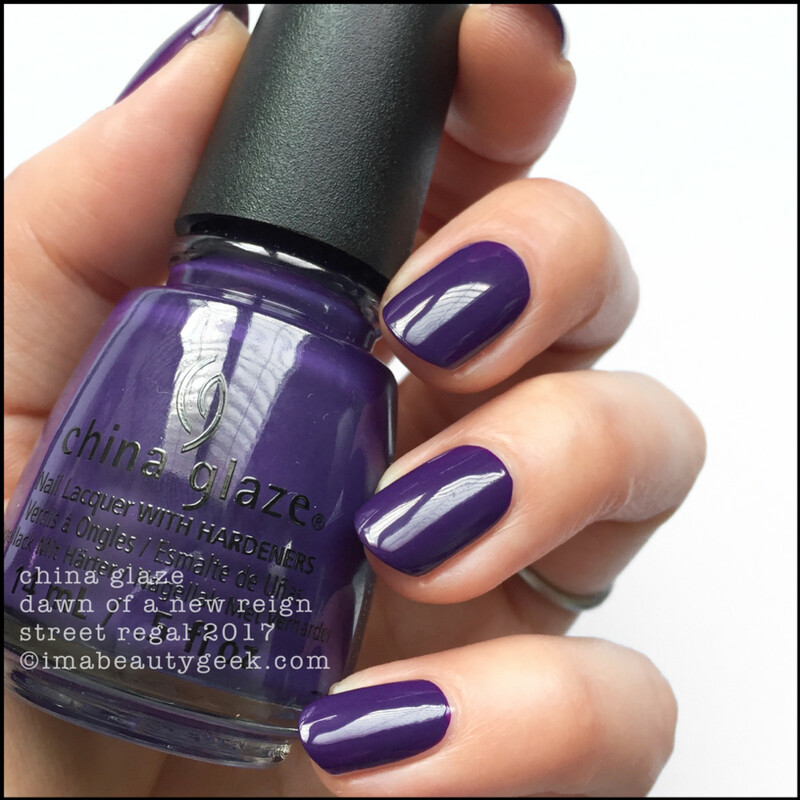 China Glaze Street Style Princess (above). It’s a pretty dove grey that has a surprisingly easy-to-work formula. If you use lots of slow, even strokes, and if you have mad skills, you can 100% OCW this! I know because I did. And then I added another coat because I like to. 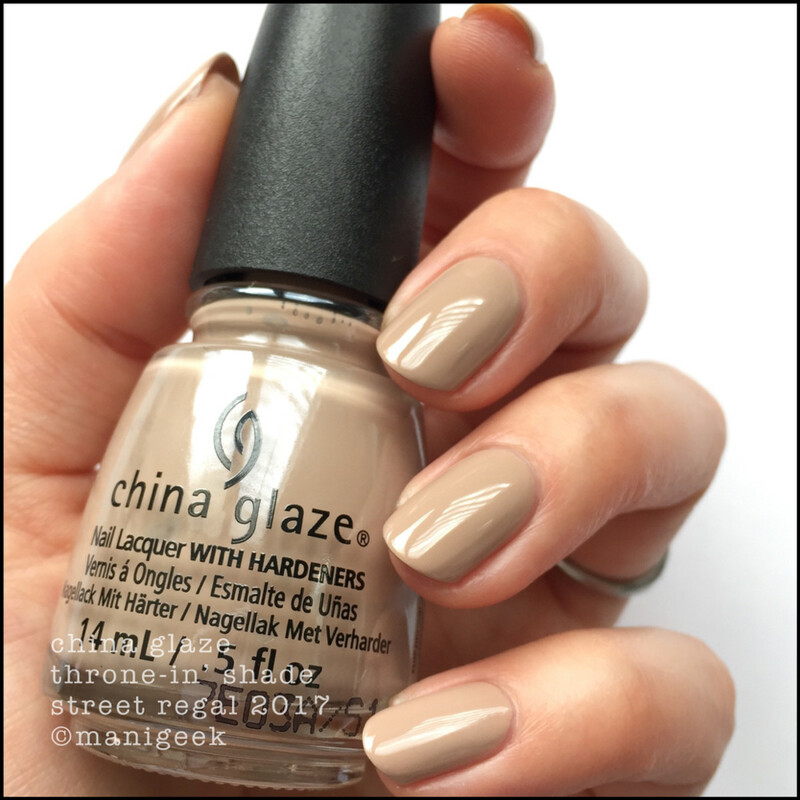 China Glaze Throne-in’ Shade (above). That’s 2 coats of this barely pink-tinted neutral and while the shade isn’t my favourite with my skin tone, the formula is pretty good. Watch your wand for gravity and once you’re done, marvel at how shiny your polish job is even without top coat! 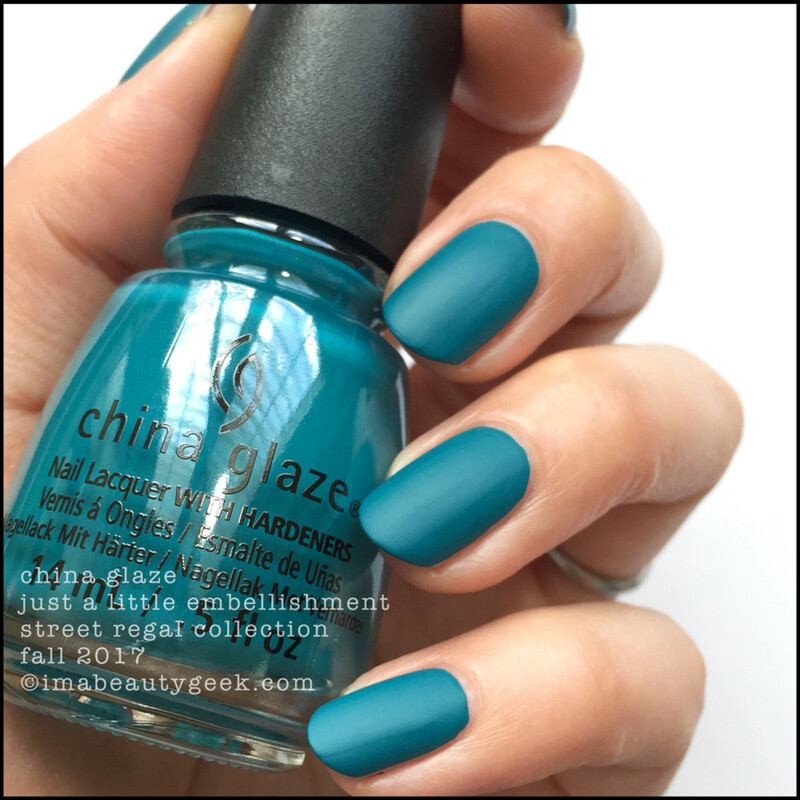 China Glaze Accent Piece (above). She’s sheer-ish and gravity here is once again your enemy. That’s 3 coats of glimmery pumpkiny gold. Or golden rod. Or something. 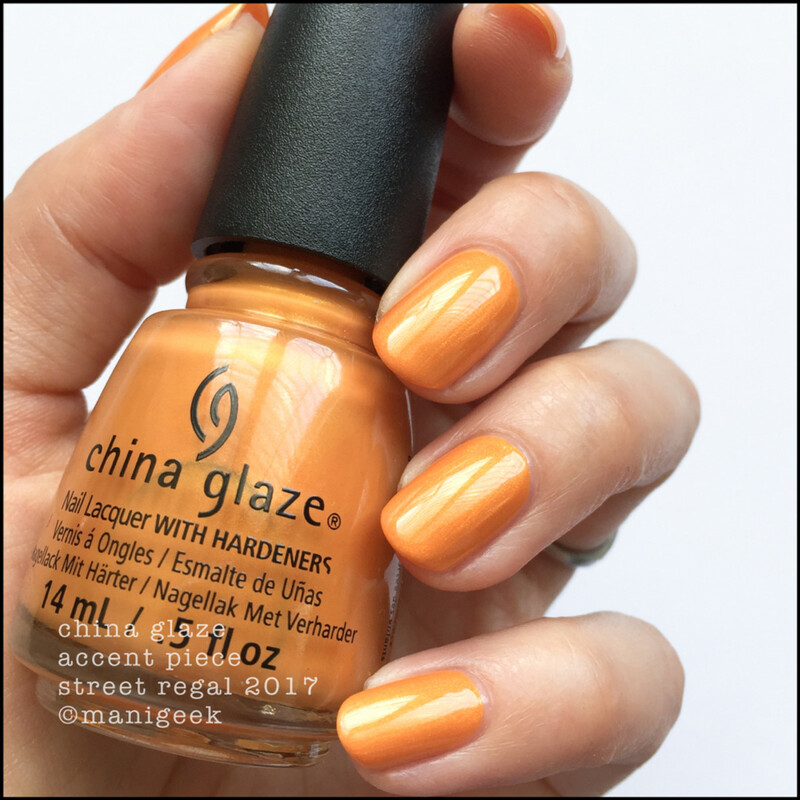 I really dig this shade; if I saw you wearing it, I’d probably grab your hands and ask you what it was. China Glaze Baroque Jungle (above). Ooooh! These formulas so far are aces! That’s 2 thin coats for maximum saturation and shimmer. I tell ya what, so far, the Street Regal collection has been a pleasure to swatch! China Glaze Just A Little Embellishment (above). Huh. I daresay that for many people this will be a OCW. Because I probably use thinner coats than you, I still had visible nail lines in 1 coat so that’s 2. Yes, it’s matte and if you work it just right, it goes on like a dreamy-dream. Oh! To be on the safe side, I’m going to suggest base coat and no twisties on removal. 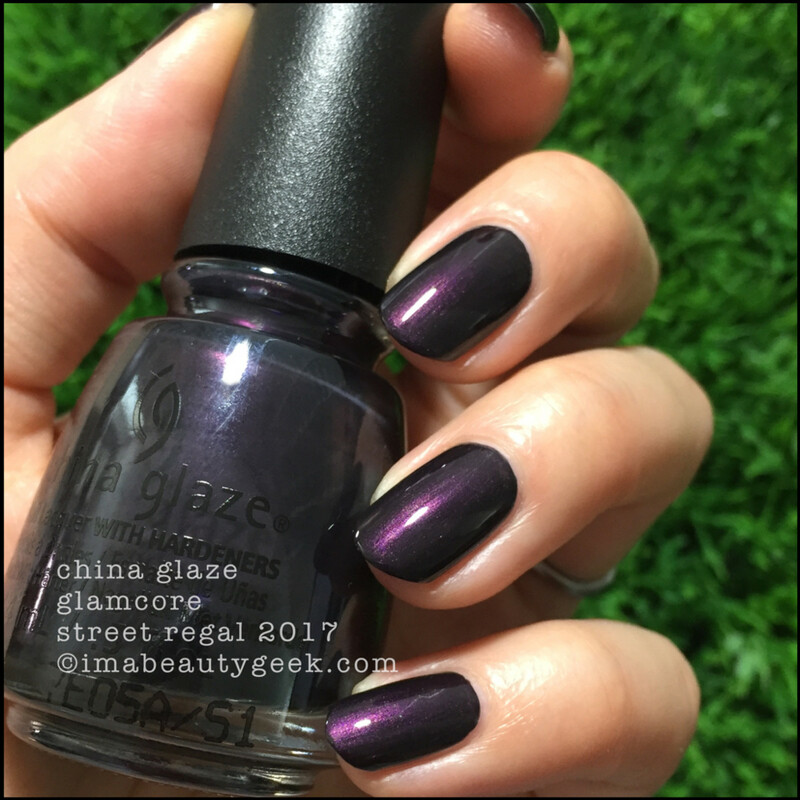 China Glaze Dawn of a New Reign (above). One Coat Wonder!! 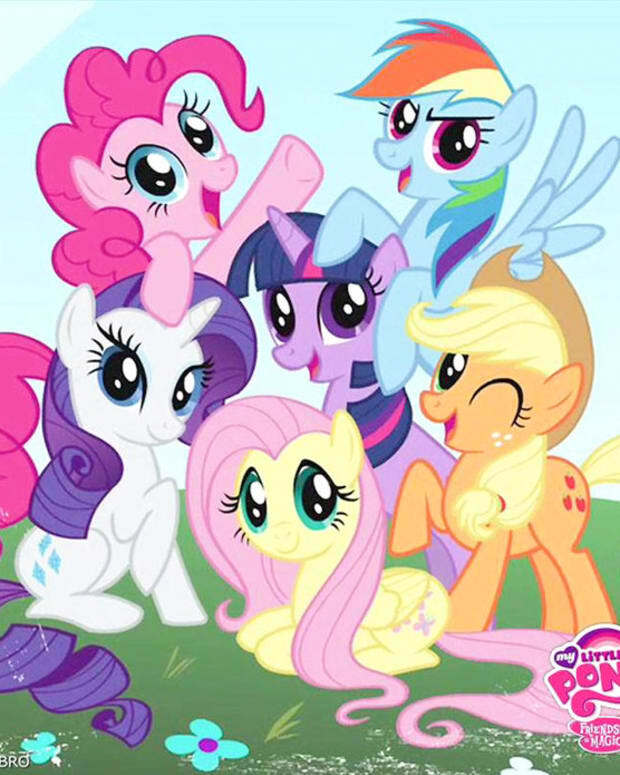 (OCW! !™) For real! If you can load this skinny brush just right and get it to do exactly what it’s meant to do, you win! Look at it! I won! 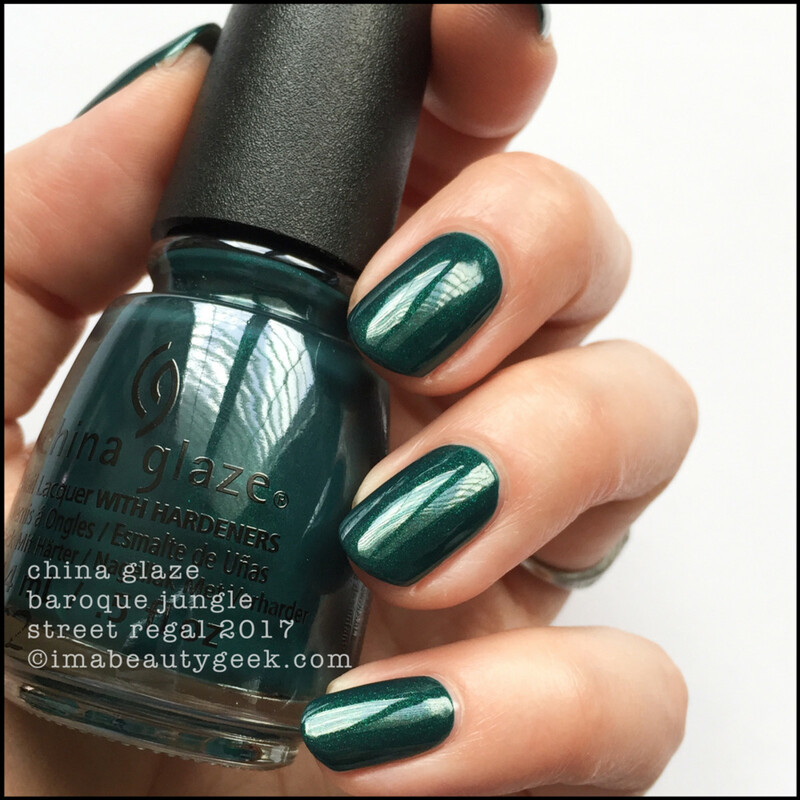 China Glaze Rock n’ Royale (above). Every once in a while I get a CG brush that’s ½ as skinny as a regular skinny China Glaze brush. That’s what happened here. No matter – I can paint with almost anything and that’s what I did. 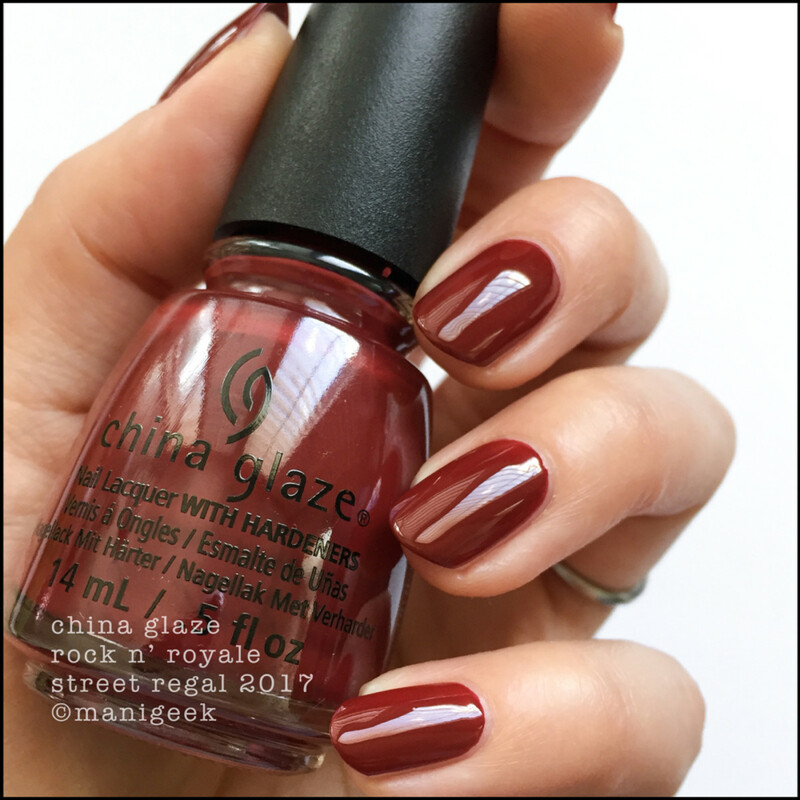 I used the über-skinny brush, kept the laws of gravity foremost in my mind, and did 2 coats to get this crazy-shiny, bricky Autumn oxblood. 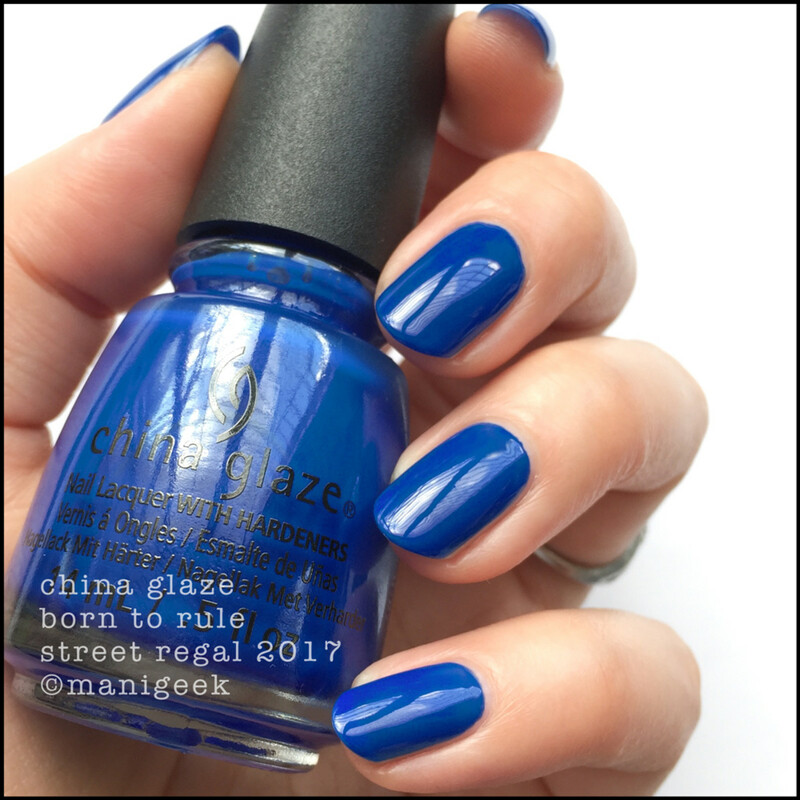 China Glaze Royal Pain in the Ascot (above). Ha! The name! Ha! My notes: “Unhh. Heart this shimmery garnet. Heart. 2 coats. 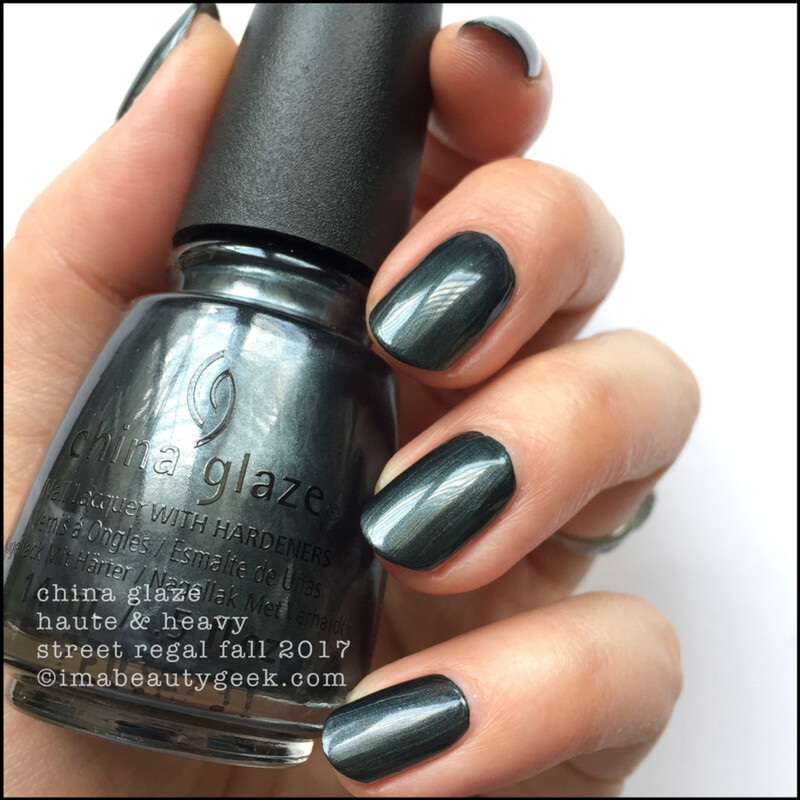 Also, I’ve become convinced CGlaze doesn’t care about people who have larger nails than a pinhead.” But still, she’s a beauty of a shade with a really, really good name. And she’ll need top coat to pop the best kind of shine. Did I top coat? Nope. But I shoulda. China Glaze Glamcore (above). 2 coats. Much too much amaze. I don’t even know how to talk about this shade of shimmery deep eggplant except to say #GimmeThat. 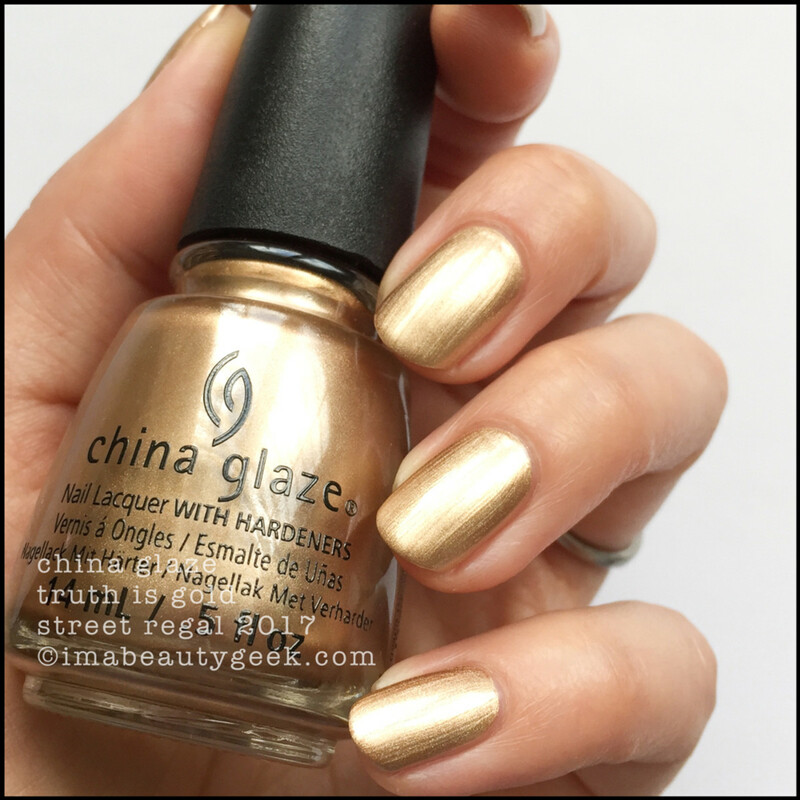 China Glaze Glamcore (with a side of salad – above). Ha – I typed Clamcore. Apparently I require more coffeeeeee. So yes, on a bed of greens, that’s Glamcore with top coat. You know you wannit. Oh. Wait. Not the end. I forgot to say where I got it! SparkleCanada.com. Man, I loves me some Sparkle! When I need to get my digits in mainstream collections, that’s always my first stop. Now it’s the end. 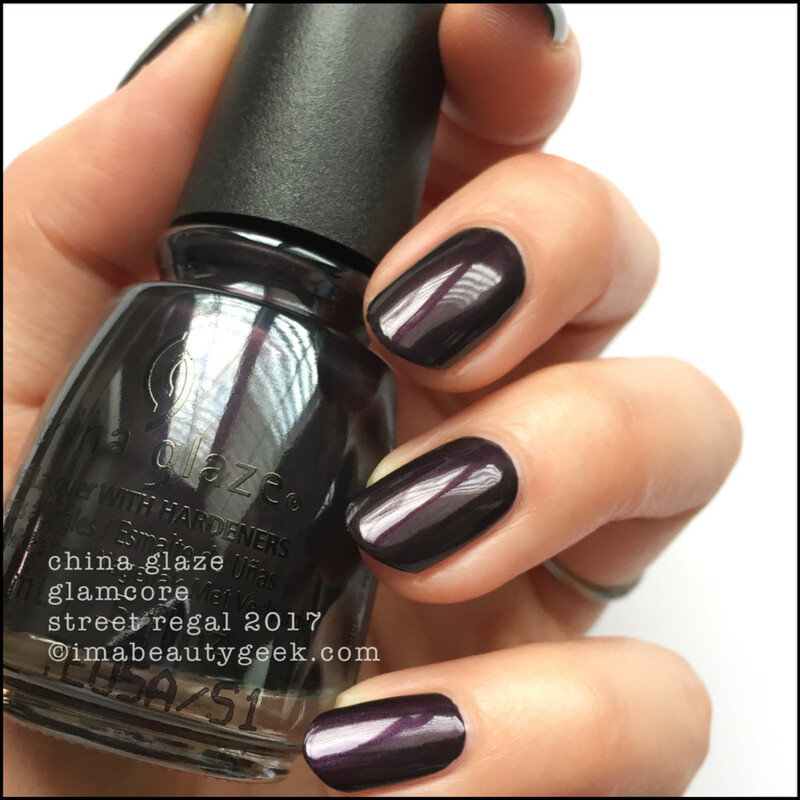 Shall we talk about the China Glaze Street Regal Fall 2017 collection now? Is it “street”? Is it “regal”? Is it both? Manicures & photos Karen Falcon (she believes her natural light photos are colour accurate at medium brightness across all iDevices; that’s how she shoots and that’s what she uses to get ‘em online).